Emotional. We do tend to attribute human feelings to inert things. Thanks a lot Phil. I have been trying to play with this haiku for a while. You saw earlier versions. The one I put up finally is the 19th try!! Expressing using an economy of words to paint a multi-tiered picture. This is Haiku. I picked this defintion up from google of course. Its not easy and I found this out in just a few attempts while I wrecked my brain to come up with something similar. I feel for the slippers and am also excited at the prospects of some good smelling and good looking feet finding their way towards somebody who is eagerly waiting to be of service. Sujata, I do like your attempt! Here is my attempt at a Haiku too! OJ da, no no please don’t turn away. You have to read this and bear with me. By the way, your Haikus on Boloji are very beautiful too. Loved Ephemeral and Caterpillar the most. Thanks k2s for the kind words. It’s taken me quite a while to come up with this haiku. What I posted was the 19th attempt. I don’t know if I have still been able to achieve the effect I wanted to achieve. Basically, the forlorn slippers were meant to be a transferred epithet. But whom it describes is left to the readers’ imagination. Also, it could be a stairway leading up to a temple, or simply a staircase inside a dwelling house. It could be a small staircase, going up to the Puja room. It could be a wide, revolving stairway leading who knows where! I wish I could make the mystery deeper. Do they belong to a woman or a man is yet another question. In any case, what I finally ended up with could perhaps be described in painting jargon as a “still life”. I did read your haiku. Why shouldn’t I? Normally, a haiku should have the 5-7-5 syllable break up. More recently though, I notice that people are not following this convention, at least in English. But they still stick to the three lines. Nice, very nice indeed! Finally I seem to have caught you in my net. I feel a bit like the Old Man who waited for the fish because he couldn’t believe it will never show up!! And yes, those smiling eyes waiting for approval will haunt me for a million years yet! Wonderful.Slippers are waiting, under the staircase.They could be taken to a temple or to a meat shop, it is not in the slippers’ hands. I too wear slippers at home, in office, as it is too hot to wear shoes, the socks give me marks which itch a lot, so yes the slippers of mine must be wondering everyday where i will take them, today maybe to the barber. Read your Haiku. It’s very intriguing! 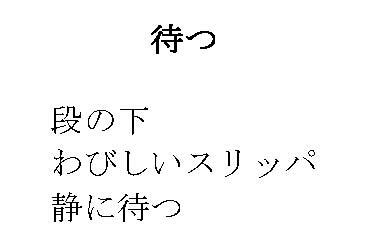 I know next to nothing about Haikus, but are they marked by the sparse beauty described by RT in one of his Chhinnapatra letters – a small floor-mat, a flower vase, probably a picture hanging in a corner, and a lot of space – the Japanese ideal of cleanliness and beauty? Tagore quoted a famous haiku (can’t remember where). I know this is not much of an introduction. If you feel interested, search google. You will find fascinating examples as well as explanations concerning the haiku art.